Planning an effortless and whimsical Christmas party can seem stressful but with these simple tips you will be planning like a party pro. The menu is usually the most time consuming and demanding part of hosting a party. Make a list of all recipes you plan to make and the ingredients that go in it. Plan and feel free to ask your guests to bring something that will help you out. Make dishes that can either be made ahead of time or frozen and then defrosted. Do as much cooking as possible before hand or choose recipes that involve limited cooking or don’t need to be served piping hot. To be the best entertainer possible, always have extra snacks you can put out if people are hungry. Whether it be extra crackers and jarred tapenade or just an assortment of nuts, you will be glad you stocked up! If you have friends or family that are vegetarians or have food allergies, be sure to be aware of those before planning your menu. Nothing will make a dinner party go south faster than someone getting sick or picking at their food. Create your menu with those needs in mind and have a variety of options. 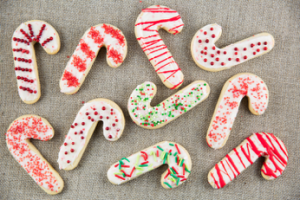 With that, here are some recipes to try at your next holiday party. Whether you are having a more casual party with strictly hoer devours or you want to start out a plated meal with something delicious, here are some great options that will be sure to dazzle your guests! 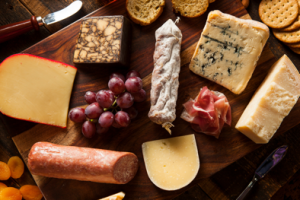 A variety of meats and cheeses. Choose a soft cheese like brie, a hard cheese like parmesan and a stinky cheese like blue. For meats, you can do a variety of prosciutto and salami. Add seasonal fruit. Some sweet fruits that pair perfectly with cheese would be strawberries, pears or grapes. Jams or preserves. Choose fig or apricot to pair with cheese. Add something salty. Choose mini pickles or olives since they pair great with meats such as salami. Crackers and bread. These provide the perfect vehicle for stacking meat and cheese. Choose a variety of crackers and a baguette. 1. Heat oven to 350 degrees F. Separate the stems from the mushroom caps. Finely chop the stems. 2. Heat the butter and 1 tablespoon oil in a large skillet over medium heat. Add the onion, green pepper, and black pepper and cook, covered, stirring occasionally, for 4 minutes. 3. Add the mushroom stems and garlic and cook, stirring, until tender, 2 to 3 minutes. Stir in the clams and cook for 1 minute. Remove from the heat and let cool for 5 minutes. Stir in the lemon juice, then the parsley, bread crumbs, and cheeses. 4. 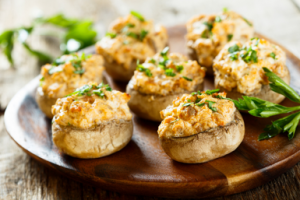 On a large rimmed baking sheet, toss the mushrooms in the remaining tablespoon oil and arrange stem-side up. Divide the bread crumb mixture among the caps (about 1 heaping tablespoon each) and bake until the mushrooms are golden brown and tender, 20 to 25 minutes. 1. Heat oven to 400° F. Place the baguette slices on a baking sheet and brush both sides of the bread with the oil. Bake until golden brown, 4 to 5 minutes per side. 2. In a small bowl, combine the cream cheese, horseradish, and 1 tablespoon dill; season with ¼ teaspoon each salt and pepper. 3. Dividing evenly, spread the cream cheese mixture on the toasted baguette slices. 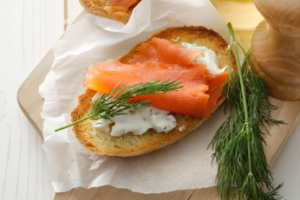 Top with the salmon and sprinkle with the remaining tablespoon of dill. 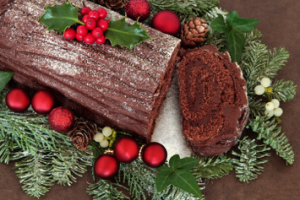 If you are having a plated dinner here are some classic Christmas favorites. 1. Place the ham in the basin of a slow cooker. 2. In a small saucepan, combine the brown sugar, honey, mustard, cloves, and water over high heat. Heat until just warm enough to dissolve the sugar. Pour the mixture over the ham, making sure to separate the slices to let the glaze get between. 3. Cook on low for 6-8 hours or high for 4-6, basting with the cooking juices every few hours. Serve immediately, or, preheat the broiler, transfer the ham to a oven-safe dish, and pour the cooking liquid into a small saucepan. Heat cooking liquid on medium-high for 5-7 minutes, or until thick and bubbly. 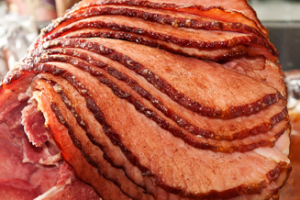 Brush onto ham, and broil for 4-5 minutes, removing to baste with additional glaze every minute or so. 1. Heat the stock and ladle 2 cups into a medium bowl. 2. Add dried mushrooms and let soak for 20 minutes, then drain, reserving the liquid. Pour liquid through a fine sieve lined with cheesecloth or paper towels to catch any grit. Add mushroom liquid back to warm stock. Keep stock heated over medium heat. Pat soaked mushrooms dry and saute in a large skillet with 1 tablespoon olive oil. 3. Heat remaining olive oil in a large, heavy saucepan over medium heat. Add shallots and cook until softened. 4. Add rice and cook, stirring, until the rice becomes translucent, about 3 to 5 minutes. Add vermouth and stir until absorbed by rice. 5. 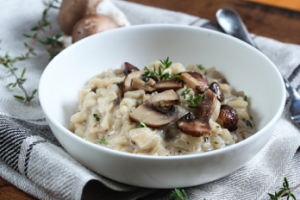 Add warm mushroom stock to rice, 1 cup at a time, stirring constantly. All stock must be fully absorbed before the next cup of stock is added. After about 20 minutes, the rice should be tender but not mushy, it should have a creamy texture. Add more stock if needed. 6. Fold in Sautéed mushrooms, Parmesan, and season with salt and pepper. Let stand for a minute before serving. Sprinkle with Parmesan, if desired. Everyone loves something sweet to finish off the perfect meal. These two recipes are classics that everyone is sure to love! 1. In a bowl, beat egg yolks, sugar and vanilla on high until thick and lemon-colored, about 5 minutes. Reduce speed to low; beat in chocolate and water until blended. Add flour and baking soda; mix well. 2. In another bowl, beat egg whites on high until stiff peaks form. Fold in the chocolate mixture. Spread evenly in a greased and floured 15x10x1-in. baking pan. Bake at 375° for 15 minutes or until a toothpick inserted in the center comes out clean. Cool in pan on a wire rack for 5 minutes. 3. Meanwhile, sprinkle a kitchen towel with confectioners’ sugar. Invert cake onto the towel. Starting from a short end, roll up cake in the towel. Place seam side down on a wire rack to cool completely. Unroll cake; spread coconut-pecan frosting to within 1 in. of edges; roll up cake without the towel. Cut and reserve a narrow diagonal slice from each end of the cake. Reserve 2 tablespoons chocolate frosting for mushrooms. Attach diagonal cake slices with a little of the frosting to opposite sides of cake with remaining frosting. With the tines of a fork, make strokes in the frosting to resemble bark on a tree trunk. 4. For the mushrooms, half marshmallows widthwise. Flatten half of each marshmallow for cap of mushroom; roll other half between palms of hands for stem. Attach caps to stems with the reserved frosting. Dust tops of mushrooms with cocoa; place around the log. 1. In a large bowl, whisk together flour, baking powder, and salt and set aside. 2. Beat butter and sugar until fluffy and pale in color. Add egg, milk, and vanilla and beat until combined, then add flour mixture gradually until totally combined. 3. Shape into a disk and wrap in plastic. Refrigerate 1 hour. 4. When ready to roll, preheat oven to 350º. Lightly flour a clean work surface and roll out dough until 1/8” thick. Cut out shapes and transfer to parchment-lined baking sheets. Freeze 10 minutes (so your shapes hold while baking!). 5. Bake until edges are lightly golden, 8 to 10 minutes. 6. Transfer to a cooling rack.